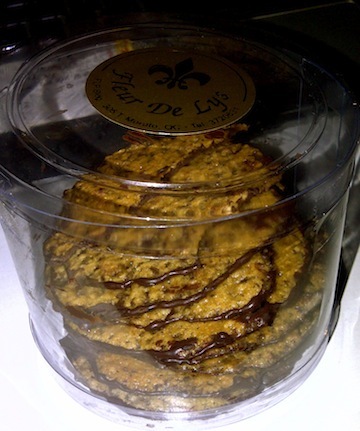 Yesterday, I ended up buying florentines from Fleur de Lys Patisserie in Tomas Morato, QC. A friend of mine was eating it late last year and I just woke up thinking about it. I guess it was really meant for me to buy some coz Rick sent the driver on an errand in Q.C. Then I also had some stuff to pick up from a supplier near Tomas Morato. So talk about hitting 2 birds with one stone. These are what florentines look like. They’re really thin cookies. The bottom portion is covered in chocolate. Yummm! It costs P160 for 15pcs. I think they also have 25 pcs. for more or less P250. I ended up buying 2 canisters! Then by night time, only a few pieces in the first canister was left! Uh oh! Then today, the craving was Pizza Hut with a stuffed crust of cheese. 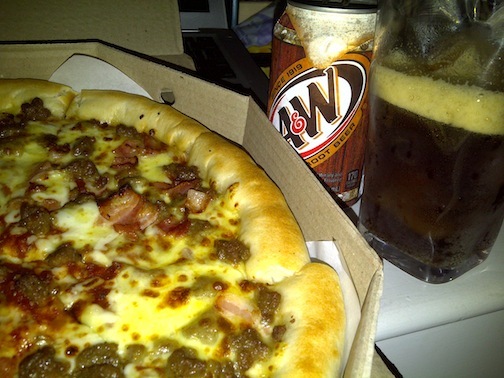 Of course, if there’s pizza, there has to be some soda. Good thing I had a can of A&W in the ref. So this was my afternoon snack. This pizza was actually for my daughter coz she wanted to eat the crust of the pizza. But then she chose to sleep when the pizza arrived. I ended up eating 2 slices, after which I had to take the box far away from me or else that would’ve been 4 slices!